Painted Rock Animal Farm & Sanctuary, Farm Animal Rescue, Animal Rescue, Schomberg, Tottenham, New Tecumseth, York Region, Ontario, Canada. 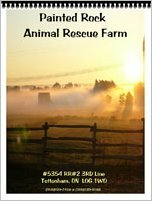 Read how Painted Rock Animal Farm & Sanctuary started rescuing animals and farm animals. For the past six years we have covered the cost for the animal care ourselves, with some help from the sales of our "Annual Rescue Calendar" which we assembled with some of the pictures of the residents here on the farm. Some of the animals that we care for also help us; how you ask? Well for example we have some fibre animals that we shear once a year then we have their fibre turned into beautiful luxurious yarn which we sell and the proceeds from the sales go back into the animals care. Now with the increasing number of animals that we care for and the high cost of vet and food bills we decided that in order for us to continue to do the work we do, we would need to reach out to others that share a love for animals. Sadly we have started turning animals that truly need our help away because the additional cost of their care is simply something we cannot afford. Although we have the room to house them and the love and care to give, the funds are just not there to allow us to take them in. We believe and have faith that there are those of you out there that share our love and passion for these beautiful creatures and would like to see us succeed in caring for every animal that requires our help. We rescued our first animal in 1997, it was a little kitten that we named Big Man and we knew then that we couldn't stop there. 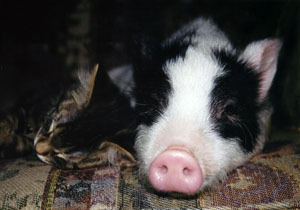 In 2003 we were living in a small rural community where we lived with our cats and a small pot belly pig named Ophelia. One day when we returned home from work we found a notice stuck to our door from the by-law officer giving us 14 days to get rid of our precious Ophelia. We didn't understand as she had never been a problem, she was like a dog, she lived in the house with us and we had a large back yard where she spend her days trimming the grass. She became somewhat of a celebrity in our small community, all the kids in the neighbourhood loved her and the neighbours would bring their vegetable peels by for her. We took her everywhere with us, to the park, to the grocery store where she'd wait outside the entrance for us and even into the bank where the staff loved to see her. We were devastated that the town was trying to get us to get rid of her. We talked about what we were going to do and decided that we would go in front of town council and ask them to reconsider but we needed to have a plan "B" so we started looking for properties for sale in the country. Before the 14 days were up we had found our farm and we put our house up for sale. The town allowed us to keep Ophelia with us until we moved, they knew that if we would sell our house and move for our pig then the least they could do was give us an extension. So we sold our house and moved into the farm in just over 60 days. So when people ask what made us get into rescuing animals here at our farm we tell them - "our pig made us do it"! Since 2003 our family has grown to over 100, we have found homes for some of the animals but because the majority of the animals we rescue are usually raised for food we are very selective as to where we place them, we have a hard time letting them go.